You will be given a reference e-book to read which has 640 pages And the test will be based on that e-book , you can take the test only after 10 days Of &nbsp;purchase. Project scheduling can be defined as a graphical presentation of forecasted tasks, dependencies, task duration, milestones, deadlines and resource requirements. It can also be defined as the process of prioritizing tasks in a project based on assigned deadlines. A person who received a project scheduling certification and is hired to effectively schedule the many tasks that the people within an organization should perform when trying to carry out a project should be skillful enough in calculating the length of time needed to complete a specific task. Definitions of project scheduling also state that the process uses three major schedules. The first one is the master schedule and this can be defined as a general summary of the entire project, from the beginning up to the end of its execution. The second one is the milestone schedule and this lists the significant events of a specific project and shown to senior managers so these people will get an idea about its progress. The last one is called the detailed project schedule which breaks down all tasks, activities and steps that need to be undertaken. The detailed schedule is the most operational since it offers a more comprehensive view of the tasks that need immediate attention. Project scheduling is also defined as a process which can be carried out by first defining the kind of scheduling needed for a project, defining measurable and precise milestones, estimating the duration of each task, defining priorities and critical path, identifying risks and reviewing possible results. 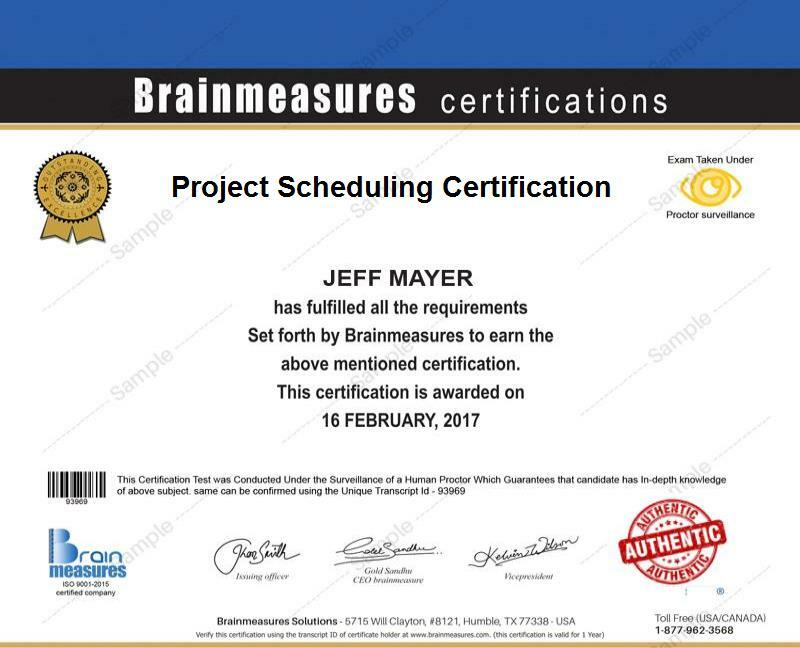 A project scheduling certification is something that you can get with pride after enrolling in the related program offered by Brainmeasures. You will definitely feel proud after finishing up a project scheduling course offered by the company since you have an assurance that you can compete with all the other experts in this field. The fact that the project scheduling certification program and its related certification test are created by experts is a sign that your skills in this field are successfully honed. The project scheduling exam created by professionals is primarily designed to assess your actual understanding on the course that you have taken. It is never difficult for you to pass the exam and get your online certification as long as you take the course seriously. The ISO certification received by Brainmeasures is also a guarantee that the project scheduling certification program that it offers is enough to compete to the somewhat competitive industry. It should also be noted that the project scheduling certification program from Brainmeasures is composed of the project scheduling course itself and its related hard copy certificate and certification exam. Note: You can view the entire syllabus of the project scheduling certification course from Brainmeasures by registering in the company and logging in to your account. While everyone is given the chance to become part of the project scheduling certification program offered by Brainmeasures since there are no qualifications when enrolling, you should know that it is more ideal for those whose profession is focused on scheduling the different steps and tasks that a project needs to undertake. These people include advanced undergraduate students and graduates of operations research, industrial engineering, construction engineering, management informatics, operations research, business administration and management science. Your project scheduling certification is a major help if you want to get a substantial amount of income. The average annual salary for a project scheduler is around $70,000. Holders of project scheduling certification who are able to land a higher-ranking job can receive a pay of as much as $104,000 per year.